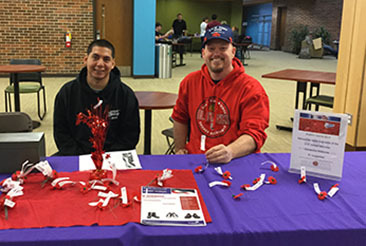 Veterans Omar Roman and Chad Martin, both of whom have graduated from McHenry County College and moved on with their education, provide poppies on MCC’s campus while they were students during Poppy Day 2017. McHenry County College was recently designated as a Military Friendly® School for 2018-2019 from VIQTORY (formerly Victory Media), a veteran-owned business, which honors colleges, universities and trade schools that are doing the most to embrace America’s veterans as students. MCC is one of 941 schools out of a field of 1,400 who were considered for the Military Friendly designation based on survey scores and an assessment of the institution’s ability to meet thresholds for student retention, graduation, job placement, loan repayment, persistence (degree advancement or transfer) and loan default rates for all students and, specifically, for student veterans. According to Lynn McCabe, coordinator in Financial Aid and Veterans Services at MCC, the college has 239 student veterans attending MCC on federal GI or state veterans’ benefits. The 2018-2019 Military Friendly Schools list is published in the May issue of G.I. Jobs magazine. It can also be found at www.militaryfriendly.com.